The Halloween that my niece was two she was absolutely in love with Princess Sofia. 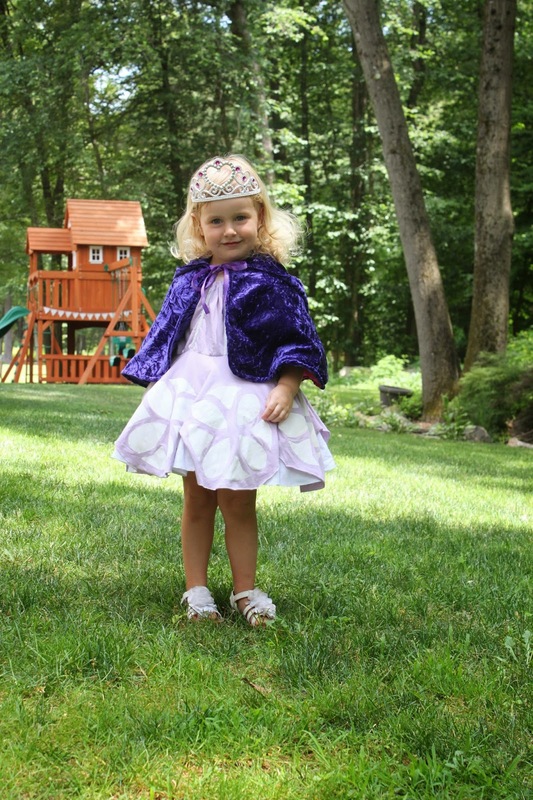 I was thrilled to stumble across the Melly Sews Inspired by Princess Sofia the First – Dress Tutorial. I knew that Ladybug would be happy with any purple twirly dress, but having the stencils for the design on Princess Sofia's dress helped grownups to know who she was. I made a peasant style bodice with an attached circle skirt out of knit fabrics. I wanted to be sure it would be comfortable and stand up to lots of play. She was still playing with it in the summer, so I think it passed the durability test! Did you make the cape, too? It's so much fun! Yes, I did make the cape as well. I made it from some crushed velvet that I had been stashing for far too long. It helped to hide the long sleeves that cool weather trick-or-treating require. Thanks!